The local governing boards passed a resolution designating Alhambra Unified School District as the Administrative Unit. This resolution shall be reaffirmed annually. Contractual agreements shall specify coordinative and administrative responsibilities of the Administrative Unit. The Administrative Unit shall employ, supervise, discipline and evaluate the SELPA Director (EC 56205). Members of the Superintendents'’ Council will make recommendations for the selection of the SELPA Assistant Superintendent to the Administrative Unit. The SELPA Assistant Superintendent shall be evaluated by June 30 each year with input from the Superintendents’ Council. The Superintendents’ Council shall consist of the Superintendent of each of the participating LEAs, each of whom shall provide a liaison function between the LEA governing board and the Council. LEA Superintendents exercise their authority and responsibilities in accordance with policies and procedures of their local governing boards and within the voting procedures of the Superintendents'’ Council. 1. Assure that the provisions of the Local Plan are implemented and the district is in compliance with the State and Federal requirements. 2. Assign appropriate and necessary staff to participate in the activities specified in the Local Plan. 3. Calendar items requiring local board approval. to the LEA Director of Special Education, LEA Superintendent, and/or SELPA Superintendents Council. 5. Direct the activities of the administrators of special education in coordinating the administration of the Local Plan. 6. Assure that required data is submitted to the Administrative Unit as required. 7. Assure that appropriate facilities are available to meet the needs of individuals with exceptional needs residing in the geographical area covered by the Local Plan. 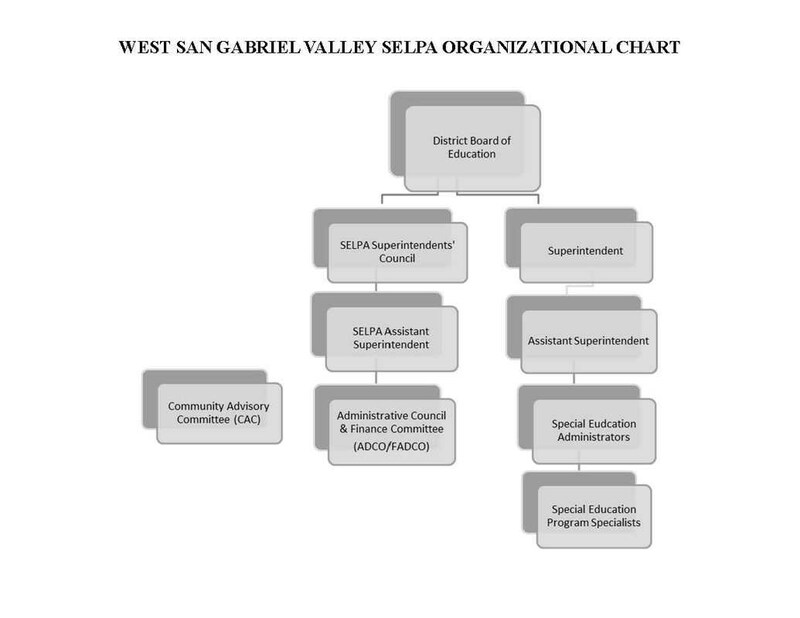 The Superintendents'’ Council is established for the purpose of governing the West San Gabriel Valley Special Education Local Plan Area as specified in the Local Plan for Special Education. The responsibility of the Special Education Local Plan Area (SELPA) is to assure access to special education and services for all individuals with exceptional needs residing in the geographic area served by the plan. 1. Develop policies, regulations and procedures relative to the governance of the SELPA and implement the same. 2. Approve operational programs to be conducted by each participating agency. designee for all meetings of the Superintendents’ Council for the duration of the appointment. B. The SELPA Assistant Superintendent is the Executive Secretary of the Superintendents'’ Council and serves as the Councils’ liaison to the Administrative Council. place and agenda of each regular meeting at least 72 hours prior to the meeting. B. A quorum for the transaction of business by the Superintendents'’ Council shall consist of a majority of the members of the Council. Council. A vote of the majority of members of the Council shall be sufficient to constitute action provided that a quorum is present. E. No alternates to the membership will be permitted to participate in meetings. meeting; the SELPA Director shall provide all support materials. The chair or co-chairs shall conduct the meeting. G. All meetings shall be conducted according to Robert’s Rules of Order. H. The Superintendents’ Council may add a sub-committee as needed which will serve in an advisory capacity only. Information about the SELPA Superintendent's Council meeting is listed below. The files are in PDF format. Adobe Acrobat Reader will be needed in order to view the document.